If you have a question for Sumangali, please feel free to send a message. Are you a Buddhist or a Hindu? I am not a follower of any religion; I follow Sri Chinmoy‘s teachings on spirituality. Given that the foundation of any religion is love of God, names and practices may vary in each, but they each strive towards the same Universal Consciousness. Sri Chinmoy’s teachings are also based on love of God, but they are not linked to a particular religion. They form a spiritual path of meditation that embraces the world as a whole; it can be applied to all cultures and walks of life. Sri Chinmoy himself was raised a Hindu, and spent his early life in his native India. At the age of 32 he then came to the West, making his home in America for the rest of his life. His teachings thus combine the ancient Eastern traditions of meditation, with the dynamism and modernity of the Western world. Personally I was raised as an atheist in the West. I always secretly had a strong faith in God, it just took me a while to find my spiritual path. For me the journey is a treasured part of the destination though, that’s what Auspicious Good Fortune is all about. I first started meditating in the 1980s, but I was not very dedicated to begin with, and it took me 10 years to find a way that would suit me. I became Sri Chinmoy’s student in 1997. It sounds like quite a long time when I say it like that, but I always consider myself a beginner. I know that every effort brings me closer to the ultimate goal of meditation: God-realisation or self-realisation, absolute consciousness of oneness with God. I am still a very, very long way off, but every day I try to take a step closer, and each effort brings its own satisfaction. If nothing else, I just aim to be happy and to be a good person. Sri Chinmoy teaches that happiness itself is progress, and progress is happiness. How long do you meditate every day? In total I personally spend around an hour or more in silent meditation every day. My main meditation is at 6am, then I may have shorter meditations throughout the day depending on what I’m doing, and always again in the evening. I tend not to focus too much on the length of time I meditate though – more on trying to keep my practice regular and sincere. Silent meditation – alone or with others – is definitely the cornerstone of my day, but the essence of my spiritual practice also comes from singing and playing meditative music, studying Sri Chinmoy’s writings, and being of service to others. Each person will be inspired by different types of spiritual practice, so it depends on the individual to some extent. Generally though, meditation raises the level of consciousness, and the aim is to become more conscious throughout every thought and action – not only while sitting in silence. Meditation can thus potentially be brought into every aspect of life, enriching and deepening every experience. So you have a job? Yes, Sri Chinmoy encourages his students to have jobs or occupations whenever possible: to be active members of society and to be of service to others. I work full time as a web designer in my home city of York, UK. I set up Pure Web Designs in 2007 and fortunately it has gone from strength to strength since then. Many of Sri Chinmoy’s students have set up their own enterprises, such as restaurants, cafés or shops, offering peaceful environments for the public to enjoy, with an emphasis on personal service. Students of Sri Chinmoy lead disciplined inner lives, but we choose not to seclude ourselves from the outer world. Having a job gives me an opportunity to serve others, as well as providing a creative outlet for my own expression. The income also supports other things I love doing – like offering free meditation classes to the public, traveling around the world to meditate with others or to give concerts of Sri Chinmoy’s music. And, of course, writing! Do you wear a sari all the time? 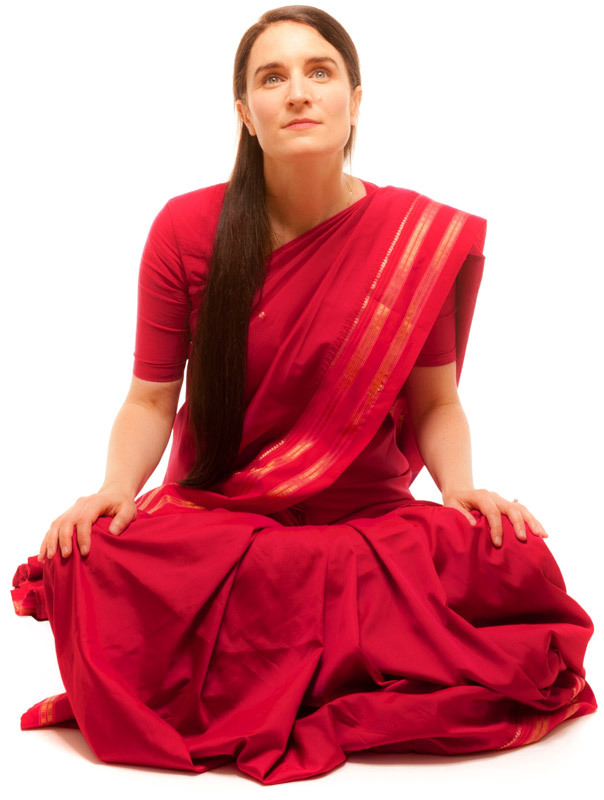 Personally I only wear a sari when I meditate together with other people, or for singing Sri Chinmoy’s music in concerts. Some people wear saris all the time, it depends where they work, and on their personal preference. For me the sari is a symbol of my spiritual life – an Indian tradition that I uphold in honour of Sri Chinmoy. Having a special set of clothing just for meditation also adds sanctity to my spiritual practice. I keep a special area in my home only for meditation, so when I go to that place I immediately find it easier to meditate. In the same way, when I put on a sari, I find it easier to make the transition from the outer world of activity to the inner sanctum of meditation. How has your spiritual practice been affected since Sri Chinmoy’s passing? That’s a good question. Everything is different, and everything is still the same. I do miss meditating with Sri Chinmoy in person, and witnessing the flow of his creativity first hand. By the same token, a genuine spiritual Master goes far beyond the boundaries of time and space, so I don’t feel he will ever leave; he is very much a constant in my life. In terms of my actual spiritual practice, I still do all the same things as I did when Sri Chinmoy was on earth. I keep up the same daily disciplines, and I still visit the place where he used to meditate with us in New York – it remains a very sacred and beautiful place, and it brings back a lot of inspiration for me. At the end of the day though, with genuine spiritual teaching, the inner bond is what really matters. That bond can be just as strong for a student who has never set eyes on the teacher, as for a student who has been with the teacher every day of his life. It can also definitely exist and thrive beyond that earthly parting.